We call them cowchips— the inadvertently dumb, the blindly arrogant and the sweetly bizarre human foibles that pile up on the figurative barn floor during the course of a year and, when it comes right down to it, really make the world go 'round. And in each of the 22 years we have been chronicling these stinkers, one cowchip appears that is bigger, steamier, more fragrant than the rest. This year it goes to frequent cowchip contributor Gov. Bill Richardson, who mounted a 64-minute-long run for the presidency late in the year, saying "I am running" on national TV at 4:22 p.m. and at 5:26 p.m. saying that wasn't what he meant. Technically it wasn't a run for the presidency; it was a stumble. It was how we like our political campaigns— short and sweet— and it was oddball enough to win the 2006 Cowchip of the Year Award. Gov. Bill Richardson, who has teased out his maybe-I'm-running-for-president- I-probably-will-but-I'll-tell-you-for-sure-later schtick for nearly two years, slipped up during an interview on the FOX News Channel and moved from the conditional verb tense to the present tense, saying, "I am running ..." Within 104 minutes, his office had issued a statement saying his quote had been taken out of context and he was still only maybe running— and he'd say later whether he was for sure. Come on, we all know Richardson is running. "I think I would appeal to true conservatives for whom conservatism doesn't mean they're angry at everybody," Huckabee said in an interview with The Associated Press. "My brand of conservatism is not an angry, hostile brand. It's one that says `conservative' means we want to conserve the best of our culture, society, principles and values and pass them on." "I would be the kind of Republican who doesn't scare the living daylights out of people who are in the center or slightly to the left," he said. Huckabee has been governor of Democratic-leaning Arkansas for10 1/2 years. He couldn't to seek re-election because of term limits. Huckabee has not said when he'll announce his decision on whether to run for president. He dismisses the idea that he needs to announce early next year. Now instead of a young, shaggy-haired, Ivy League, anti-war liberal whose greatest claim to fame was running Texas for McGovern in '72, imagine a candidate who graduated from an in-state Baptist college, was an ordained Baptist minister and had taken a turn running the state's Baptist Convention. One is recalled as a unifying force to Baptist Arkansans. One who hosted a religious-oriented TV show. The political connections - the familiarity - were instantaneous for Huckabee. But, unlike Clinton, he was not somebody who dreamt and angled his whole life to be in a place from where he could run for president. I think Huckabee's experience as Baptist minister and leadership of the Arkansas Baptist Convention will scare the living daylights out of a lot of moderates of both parties. 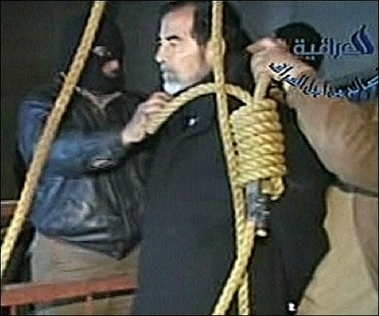 Al Arabiya TV reports Saddam Hussein Has Been Executed. May he rot in hell for all eternity. Saddam had approximately 40 of his own relatives murdered. 1980-88: -Iraq war left 150,000 to 340,000 Iraqis and 450,000 to 730,000 ians dead. 1983-1988: Documented chemical attacks by Iraqi regime caused some 30,000 Iraqi and ian deaths. 1993: Iraqi government was involved in a plot to assassinate former President George Bush during his April 14-16, 1993, visit to Kuwait. Imge: A video grab taken from al-Iraqiya television (AFP/Al Iraqyia TV). 2) and will NOT run for re-election to the U.S. Senate. Why wait, if the Senator has decided shouldn’t he tell us now? "An insurgency fighter... threw a fragment grenade into the overwatch position which hit Petty Officer Monsoor in the chest before falling in front of him. Petty Officer Monsoor yelled "Grenade!" and dropped on top of the grenade prior to it exploding. Petty Officer Monsoor's body shielded the others from the brunt of the fragmentation blast and two other SEALs were only wounded by the remaining blast." In April 2004, 24-year-old Marine Cpl. Jason Dunham made a similar sacrifice, as he used his body to shield fellow Marines from an exploding grenade. His father described his son's decision to give his life for his comrades thus: "When you are in a war situation, that guy beside you is your brother or sister. And I think that most of us would give up our lives for our family." Most recently, 19-year-old Pfc. Ross McGinnis saved the lives of four of his comrades in similar fashion. On Dec. 4, when manning a turret-mounted machine gun, a grenade was thrown into Pfc. McGinnis's Humvee. Rather than escape through the vehicle's turret, he threw himself into the truck and on top of the grenade, absorbing the blast. There's more, go read the whole thing. We are truly blessed to continue to have men such as these willing to defend us and our way of life. John Edwards tells us what we already knew - he is running for the 2008 Democratic presidential nomination. Edwards claims his experience as the 2004 Democratic vice presidential nominee gives him an edge over potential rivals. Maybe Edwards means the five of the remaining prospective 2008 Democratic presidential candidates - Clinton, Dodd, Obama, Richardson, and Vilsack, who not previously run for president. Making his announcement dressed in jeans, Edwards called for the start of U.S. troop withdrawals from Iraq, argued that the U.S. should lead efforts to stop the genocide in Sudan and the atrocities in northern Uganda. He also blasted the "McCain doctrine" - increasing U.S. troop levels in Iraq, saying it would be an enormous mistake to escalate the war. According to the Washington Post, Edwards favors withdrawing 40,000 to 50,000 troops from Iraq as a signal to Iraqis. Edwards' campaign will be based upon class warfare, emphasizing "two Americas" -- haves and have-nots -- that he spoke about during his 2004 campaign. I find it very disingenuous when multimillionaires say they want to campaign on behalf of the downtrodden. I have a hard time taking Edwards seriously. After campaigning practically nonstop for three years he has failed to raise enough money to pay the bills from his campaign for the 2004 nomination. How will he compete against Clinton, Obama and the other eight prospective Democratic candidates in fundraising? A transcript of his official announcement is available in the extended post. With Gilmore, there are again 24 prospective 2008 presidential candidates. President Bush and Senator Clinton are mentioned most often when Gallup asks the public which man and woman they admire the most. Likely presidential candidate, Illinois Senator Barack Obama joined the list for the first time, coming in fourth behind Presidents Bush, Clinton, and Carter. I was surprised to see President Bush at the top of the list given his approval ratings, but presidents usually are the most admired men, having won the top honor 49 of the 60 times Gallup has posed the question. President. Bush earned the distinction of most admired man with almost no assistance from Democrats. Less than one-half of one percent of Democrats mentioned him. The poll is bad news for Senator McCain, who fell out of the top ten this year. This is the eleventh time Senator Clinton's finished as the most admired woman. She finished second in 1995 and 1996 (to Mother Teresa) and 2001 (to Laura Bush). Hillary's first place finish won't hurt her presidential campaign, But Obama's fourth place finish must give her pause. A recent Concord Monitor poll shows Illinois Senator Obama about even with New York Senator Clinton among likely voters in the 2008 Democratic presidential primary. Twenty-two-percent of the likely Democratic voters who responded to a Concord Monitor poll said they'd vote for Clinton if the primary was held today, and 21 percent said Obama. On the Republican side, New York Mayor Rudy Giuliani and Senator John McCain are about even, with Giuliani at 26 percent and McCain at 25 percent. These polls don't reflect much besides name recognition. Only political junkies are paying attention to the 2008 race now. It will stay that way until after the summer. Gerald Ford, the nation's 38th president, was the accidental president, the only president neither elected to the office nor the vice presidency, died at 6:45 p.m. yesterday. He was 93. Ford was elected as a Michigan Republican Congressman 13 times before being appointed vice- president on December 6, 1973, two months after Spiro Agnew pleaded no contest to a tax evasion charge and resigned. 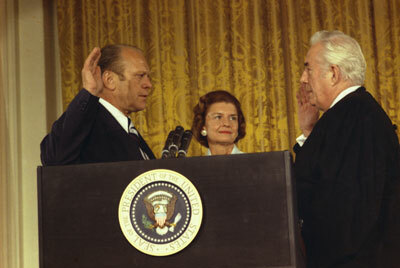 Ford was the first vice president appointed under the 25th amendment to the Constitution. Ford was the longest living former president, surpassing Ronald Reagan, who also died at 93, by more than a month. Ford became president when President Nixon resigned on August 9, 1974, to begin "that process of healing which is so desperately needed in America:"
"My fellow Americans," Ford said, "our long national nightmare is over. Our Constitution works. Our great republic is a government of laws and not of men. Here the people rule." I am acutely aware that you have not elected me as your president by your ballots. So I ask you to confirm me with your prayers. President Ford's approval rating reached 71 percent. The high approval rating only lasted a month. On September 8, Ford granted Nixon a full pardon for all federal crimes he had "committed or may have committed" when he was in the White House. Opinion polls showed a large majority of Americans opposed the pardon. It was denounced in Congress, including by members of Ford's own party. By January 1975, his approval rating had plummeted to 36 percent. But an ABC News poll taken in 2002,,30 years after the Watergate break-in found that 60 percent said the pardon was the right thing to do. President Ford vetoed 66 bills in his barely two years as president. Congress overturned 12 Ford vetoes, more than for any president since Andrew Johnson. Ford survived two attempts on his life in September 1975. Lynette "Squeaky" Fromme, a 26-year-old follower of Charles Manson, was arrested after she aimed a semiautomatic pistol at Ford on Sept. 5 in Sacramento, Calif. A Secret Service agent grabbed her and Ford was unhurt. Seventeen days later, Sara Jane Moore, a 45-year-old political activist, was arrested in San Francisco after she fired a gun at the president. Again, Ford was unhurt. 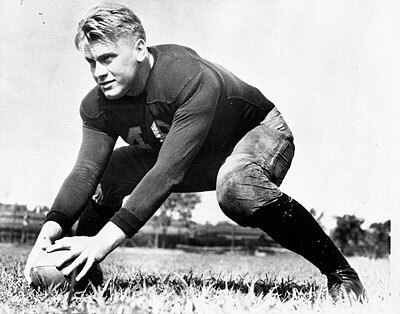 Ford was an adequate student, an outstanding football player and an Eagle Scout. He played center on the University of Michigan's 1932 and 1933 national champion football teams. He got professional offers from the Detroit Lions and the Green Bay Packers, but chose to study law at Yale, working his way through as an assistant varsity football coach and freshman boxing coach. 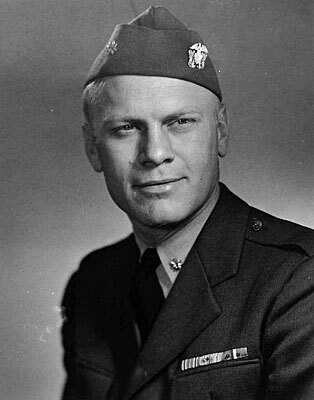 During World War II Ford joined the Navy and spent 47 months on active duty. He left the Navy in 1946 with the rank of lieutenant commander. Ford was the last surviving member of the Warren Commission, which investigated the assassination of President Kennedy in 1963 and concluded that Lee Harvey Oswald acted alone.